You are paying for the bloated salaries of fast food CEOs. McDonald's saved $14 million in taxes over the past two years using a loophole that lets companies deduct the costs of performance-based executive pay, according to a report released Monday by the Institute for Policy Studies. Fast-food giants save money by paying their typical workers very little, but they also save money by paying their CEOs millions, thanks to a quirk of the tax code. In both cases, American taxpayers cover the cost. Companies of all types can and do take advantage of the performance-pay loophole, but this study focused specifically on fast food. It's at least the second way the industry hits the federal government's budget: Low wages at the nation's 10 largest fast-food companies -- which typically hover about a dollar above the federal minimum wage -- cost taxpayers $3.8 billion per year, because workers have to rely on government assistance to get by, according to a recent study by the National Employment Law Project. 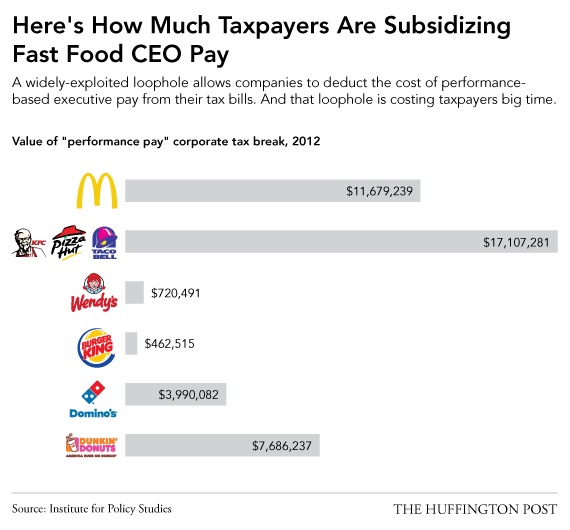 "(Fast food companies) are a double burden on the taxpayer," said Sarah Anderson, the author of the IPS report. "We're trying to expose the disparity here between CEOs' policies when it comes to worker pay versus the generous subsidies that they're getting from their own pay." McDonald's and other fast-food companies have come under fire in recent months over discrepancies between how they treat executives and typical employees. 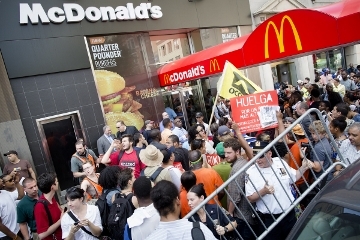 Labor organizers expect fast-food workers to walk off the job in 100 cities on Thursday, demanding a wage of $15 per hour. The company has also taken heat from advocacy groups over a sample employee budget McDonald's released earlier this year, indicating that a worker would need to take a second job in order to survive on McDonald's wages. McDonald's recently bought a new $35 million corporate jet, and a petition asking the company to cancel the order "until all of your full-time workers earn enough to live without public assistance" has garnered more than 200,000 signatures. At the same time workers claim they're struggling, McDonald's CEO pay is being subsidized through a tax loophole that is actually the result of a backfired effort to limit executive pay, according IPS' Anderson. In 1993, Congress capped the amount of pay companies could deduct from their tax bill at $1 million, but lawmakers left a loophole in place that lets companies deduct unlimited amounts of performance-based pay, like stock options and certain types of bonuses, from their tax bill. "It led to this explosion of huge stock-options grants," Anderson said. "That reform is really pointed to as one reason why CEO pay has exploded so much in the past couple of decades." Indeed, CEO pay has grown 127 times faster than worker pay over the past 30 years, according to a May 2012 report. Despite the discrepancy between McDonald's CEO Don Thompson's $13.8 million compensation package and the $8.94 hourly average pay for a fast-food worker, Thompson claims the company isn't exploiting its workers. "We're about providing opportunity," Thompson told Bloomberg earlier this year. "When we can help people to be able to have viable income, we're going to continue to do that, and we are going to provide opportunities so that a person can rise through the system and gain greater and greater wealth."